Unlimited entry to Filmed by Bike plus access to exclusive events. EARLY BIRD RATE: Only $60! Waltz into the theater, grab some popcorn, and enjoy show after show, event after event, all festival long. Festival passes are for sale online at all times or at the Festival Box Office during open hours. It is easiest to purchase a pass online. NEW THIS YEAR! When you purchase your Festival Pass online, you may log in to reserve your tickets for all films and events. 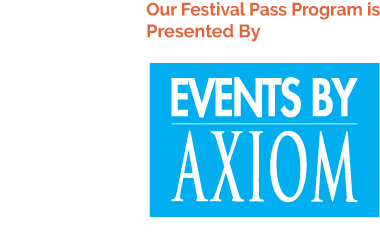 A Festival Pass guarantees you will never have to pay for additional films and events, but it does not guarantee a spot. Be sure to reserve your space in advance online as some shows and events will sell out. We recommend you pick up your Festival Pass Badge on Friday at the Opening Night Street Party from 5-10 p.m.. There will be a line from 5-7:00 p.m. The Friday Box Office is open until 10:30 pm. You may pick up your Festival Pass Badge at the Festival Box Office any time during Box Office Hours. You may pick up for other people. If you wish to attend the Filmmaker Bike Ride, you will need to reserve your ticket in advance as space is limited. To ensure your friends get to experience Filmed by Bike with you, encourage them to also purchase a Festival Pass. It’s the easiest way to all go to the movies and festival events together! You may purchase individual tickets for other people when you are logged in to your Festival Pass account. Get ready to be inspired by movies from all over the world. Then get ready to ride your bike! Events by Axiom is the company behind some of the best rides in the region. They offer a season-wide calendar of ride variety signature favorites like Portland Century and the Worst Day of the Year Ride. Look for their calendar and other treats inside your Festival Pass Badge.